Everyone's talking about quotation marks! 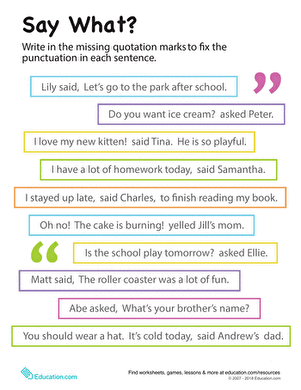 Help your third grader learn about quotation marks with these punctuation worksheets. Practise perfect punctuation with this quotation mark worksheet that teaches the finer points of quotation mark usage, like marking quotes inside of quotes. This worksheet is a fun-filled way to write dialogue about a familiar party staple: balloons. Your 3rd grader creates the conversations between family members. Punctuating dialogue can be hard for kids to remember how to do. This worksheet helps them practise and shows examples. This narrative writing worksheet teaches your budding author how to use quotes. Correctly using quotes in writing comes in handy for all ages. Quotation marks and periods can be confusing. Become a punctuation master with this informative worksheet complete with examples and practise problems. If your child needs some punctuation practise, give him a challenge with a quick quotation marks quiz! Kids learn how to cite different kinds of titles by adding underlining them or adding quotation marks. Help your third grader learn how to use quotation marks with this worksheet that asks him to place quotes where they're needed.